I have talked a lot in this blog over the past several weeks about investing and saving, but what is our goal in the end? What are we sacrificing now in order to have in the future? Too many of my Soldiers, both young and old, see retirement as nothing more than a pipe dream that they will never reach. They think that they will have to work until the day they die. That is incredibly sad. When I retire, I want to do something that I love or work that I’ve always wanted to do. What is your retirement dream? You need a long term goal to aim for now. You can change it along the way, but you still need something to motivate you now to keep you on track saving and investing. In 2001, my parents got up one day, sold their house, and bought a houseboat. I have to tell you that most of my family though that they were a little crazy, but they didn’t care. I guess that is one way to know that you are on track to live like no one else. I have never seen my parents happier. 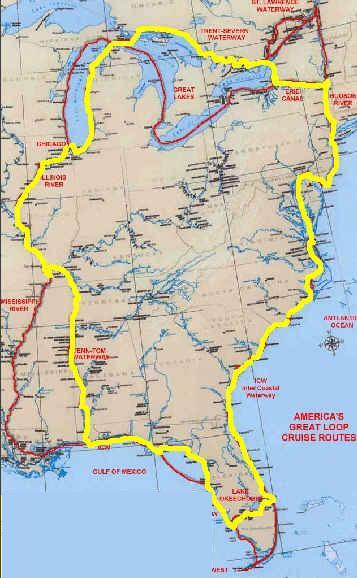 Their goal is to one day soon sail the “Great Loop”, a 7,500 trip up the eastern seaboard, into the Great Lakes, down the Hudson, Tennessee, Ohio, and Mississippi Rivers, and back around Florida. It’s an awesome idea and a fantastic retirement dream. Because my step-dad invested carefully, planned, and never lost sight of their goal, they are now living “The Dream” in retirement. I can only hope and pray that we are all so lucky and blessed one day. Don’t waste one second more. Figure out your retirement dream with your spouse or loved ones (you can change it as your life changes), tell a lot of people (peer pressure is a great way to keep you on track), and never lose sight of your goal in the end. It will make all the sacrifices along the way well worth it. Setting goals is really important, I wrote a couple of blog posts about it as well. I’m glad you tackled it to, as I think it is overlooked on a lot of money management and investment blogs.